Everybody is discussing about Media trial, Media ethics, conducting sting operations and investigative journalism.Culprits who escape using their power are brought to justice by Media.We have seen that in some of the cases here. What can be worrying !!!! If Media uses unethical means to publish news and create sensation.That has led to the closure of 168 year old paper “News Of The World”. 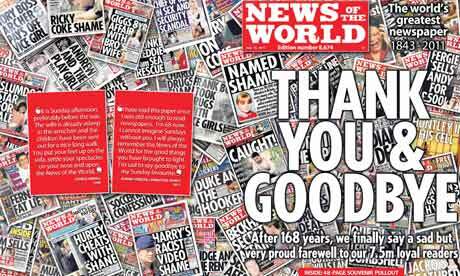 The News of the World was a national tabloid newspaper published in the United Kingdom from 1843 to 2011, printing its last edition on 10 July. By 1950, the News of the World had become the biggest-selling newspaper in the world with a weekly sale of 8,441,000 and individual editions sold over 9 million copies.In 1969, Murdoch buys The news of the World. Sales averaged 2,812,005 copies per week in October 2010. The Dark Arts – Hacking into voice mails was being done.They published stories of celebrity affairs and them involving in drugs.They hired ppl who helped obtain confidential info. In 2005, personal details about Prince william know to very few appeared in News of the World articles. – Prince William pulled a tendon in his knee, one revealed. These sort of dirty news of no use to someone created spark among police and people. The police had seized files from Mulcaire’s home in 2006 that contained several thousand mobile phone numbers of potential hacking victims and 91 mobile phone PIN codes. In 2007, Mulcaire and Goodman apologized in court to prnces for invasion of privacy.They were sentenced to several months in prison.In 2008, News paper agrees to pay 700,000 punds to Gordon Taylor whose phone was tapped by Mulcaire. Andy coulson the editor of the News of the world during hacking is arrested on july 8.He also served as PM Cameron’s chief press officer. Finally the Newspaper is shutting down.The 8,674th edition apologised for letting the readers down. The front page bore an epitaph, “The world’s greatest newspaper 1843-2011”, with the note, “After 168 years, we finally say a sad but very proud farewell to our 7.5m loyal readers”. On the back page were quotes from British literary great George Orwell. “Phones were hacked, and for that this newspaper is truly sorry… there is no justification for this appalling wrongdoing.” accepted Newspaper. A series of massive earthquakes have struck north-east Japan, unleashing a 10-metre tsunami that swept buildings, vehicles, crops and debris across swaths of farmland. The first 8.9 magnitude shock is said to be the biggest to have hit Japan in 140 years, rocking buildings 235 miles (380km) away in Tokyo and sparking fires. At least five people are known to have died, but amid widespread reports of landslides, floods, collapsed buildings and fires the death toll is expected to rise. The quake hit at 2.46pm (5.45am GMT), about 6 miles below sea level and 78 miles off the east coast. It was swiftly followed by five powerful aftershocks of up to 7.1 magnitude. A 19-nation tsunami alert had been issued. The next few nations to be hit by tsunamis are Taiwan in 30 minutes, Indonesia at 4.30 pm, Hawaii at 6 pm, New Zealand at 10.50 pm, Australia at11.15 pm.There is a warning of multiple 10-ft high tsunamis. We all know Nandan Nilakeni was appointed as Chairam of UID. Now, TCS vice-chairman S Ramadorai is all set to be appointed an adviser to the PM on skill development as part of a government-led initiative to impart more training to the workforce. As an adviser to Prime Minister Manmohan Singh, Ramadorai will enjoy the rank equivalent to a Cabinet minister. An official announcement on his appointment is likely to be made on Monday. The PM’s Council on National Skill Development has a mission of creating 50 crore skilled people by 2022. Of these, the target for the National Skill Development Corporation, which began its operations in October 2009, is 15 crore, according to finance minister Pranab Mukherjee’s budget speech for 2010-11. The National Skill Development has done a comprehensive skill gap study of 21 high growth sectors and has approved three projects worth about Rs 45 crore to create 10 lakh skilled manpower at the rate of one lakh annually. Analysts said the challenge for skill development in India is huge given the lack of training institutes.In India there are 1,900 industrial training institutes compared to China’s 100,000. Faced with acute shortage of skilled manpower such as plumbers, electricians and rig operators, some Indian companies have set up in-house skill development centres. The government says the major challenge of skill development initiatives is also to address the needs of huge population by providing skills in order to make them employable and help them secure decent work. It says skill development for people working in the unorganized sector is a key strategy in that direction, and says it will also inculcate dignity of labour and create greater awareness towards environmental, safety and health concerns. 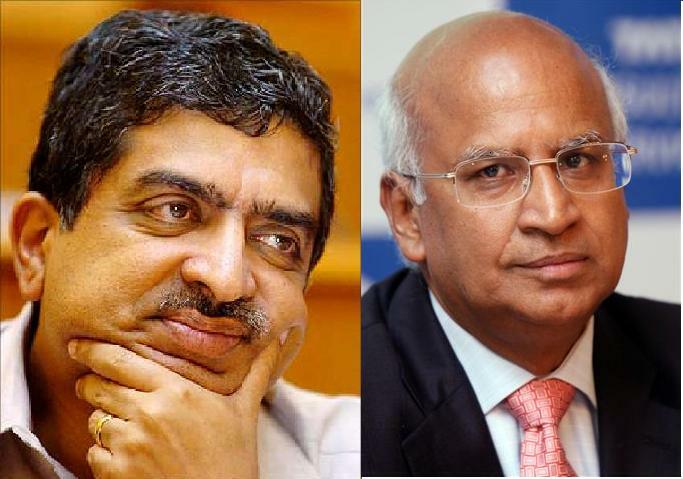 It is good that people like Nandan Nilakeni and Ramadorai who are corporate bigwigs are assisting our government for progress of the country. We expect this trend brings Protocols,discipline and ethics in government offices. This would increase competition as Service providers will introduce schemes to pull customers to their network.Only disadvantage is we cannot use same number in a different state. ere’s all about how MNP works in six simple steps. 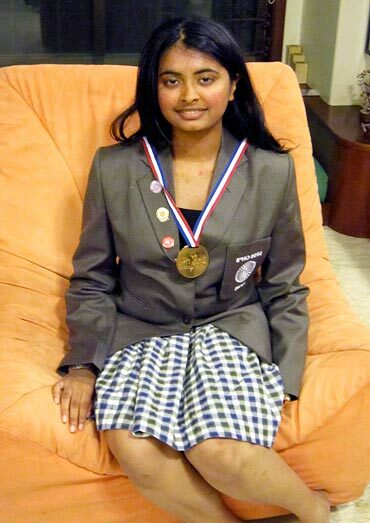 Aakanksha Sarda was recently in the news for standing 18th in the country at the IIT JEE examinations. Sarda is the first Indian girl to achieve this feat — she stood 12th among the 376 students from 82 countries and first among the girls. On an average day, the Indira Gandhi International Airport at Delhi handles over 700 flights, which carry more than 62,000 passengers. In 2002-03, the same airport was handling only 77 flights a day. Has the ten-fold increase in passenger traffic been accompanied by a concomitant upgradation of facilitates related to air safety.This is the possibly the answer for many flight mishaps.Frequently we are seeing lot of accidents being averted narrowly. The crash of the Air India Express plane piloted by a Serbian national on Saturday has put the focus back on whether foreign pilots with various Indian air carriers are able to operate in a country with a diverse topography. There are around 560 expat pilots currently employed with various airlines in India and they account for 10 per cent of the total strength of the 5,500 civilian pilots. 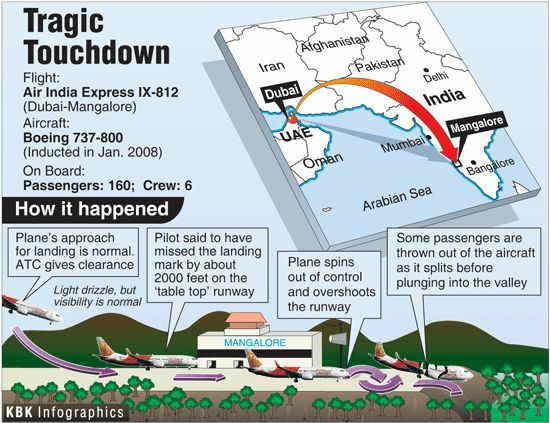 Air India Express, the low-cost arm of the national carrier, has 125 expat pilots and they reportedly face a number of problems while operating a flight in the country when they are in the cockpit. In all, Air India has 250 expat pilots. Foreign National or air traffic or stress these issues need to be addressed immediately to stop any flight or chopper crashes in future.YSR death due to chopper crash is still a unresolved mystery.President pratibha patil had a near miss last year when an Air Force helicopter carrying President Pratibha Patil landed on the same runway from which a Delhi-bound Air India aircraft with 150 passengers was about to take off. We need to immediately clear the air traffic mess. A landmark court victory last week was won by Hindus and Sikhs in Britain that will allow mourners to cremate their dead on funeral pyres. The ruling was given after a lengthy battle waged by Davender Kumar Ghai, 71-year-old Hindu for the right to be cremated by “sacred fire” according to the ancient diktats of his religion. Britain is likely to become the only country in Western Europe to allow natural cremations, which are permitted in 27 countries across the world including 15 where neither Hindus nor Buddhists — who also use funeral pyres — form the majority of the population. Funeral pyres are allowed for Aboriginal cremations in Australia and also in two American states, Colorado and Vermont. It is applaudable verdict when within a state people are fighting for division and ownership.